No road, no disco, - no stress. Leave it all behind. No air con or 24 hour power – only pure bliss! Hidden in a small bay, surrounded by a white sandy beach, coconut palms and rain forest, Dolphin Bay Diver's Retreat is just a 20 minute boat ride away from Taveuni. Choose from more than 20 dive sites on one of the top ten dive spots in the world - the famous Rainbow Reef; snorkel, trek up the mountain, swim with the turtles and let our amazing Fijian crew take care of you. Accessible by boat only, Dolphin Bay Diver's Retreat is the ideal place for diving and getting away from it all. 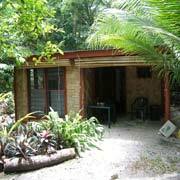 All accommodation is close to the beach. 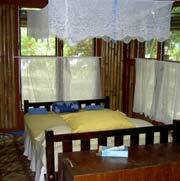 Choose between 4 bure (traditional Fijian Style bungalows) with private facilities or Jungle Tents with shared facilities. Tickle your taste buds with delicious food made from scratch, sip a glass of wine in your hammock and watch the fish go by; enjoy dinner on the beach or get pampered in our beach side Massage bure. Our bures are locally built from bamboo and hard wood. They are not fancy, but comfortable, with double beds, inner spring mattresses, mosquito screens and nets as well as solar lights. For rain water collection, the roof is not made from reeds or natural materials. The Turtle & Manta Bures are about 15 meters from the beach. Both have Queen beds, mosquito nets, settee and en suite with hot water showers, veranda, hammock, solar lights, coffee & tea making facility. Be adventurous and stay in a Jungle Tent (large room with standing head space and mosquito screens) double or single beds with inner spring mattresses make you sleep like a baby. Sorry no solar power, but you will get a solar lantern. 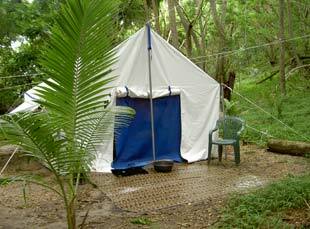 The Jungle Tents share 2 showers and 2 toilets. 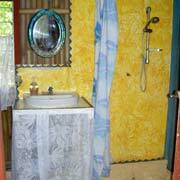 A nice way to end your diving holiday, or a trip on its own - our Taveuni Guesthouse is a different experience. 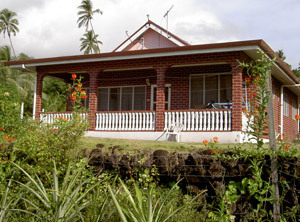 It overlooks the ocean on the southern side of Taveuni close to Vuna; in walking distance of a black sandy beach and great snorkeling right in front of the house, you are almost back to civilization. You can share the house with Simmi and Kamal and enjoy Simmi's fantastic Indian cooking or you can rent the house for your family and cook for yourself (or still enjoy Simmi's cooking). 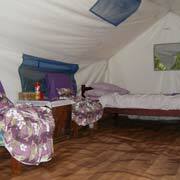 The rooms are not fancy but very comfortable and clean. Most meals are taken on the veranda overlooking the Somosomo Strait. The inside of the house is non smoking and you have to bring your own alcohol, however soft drinks and kava are readily available. Power comes from a generator and during off power times you have solar lights. There is no road leading to Dolphin Bay Divers Retreat, even though your map might say otherwise. So renting an SUV is only going to get you to Buca Bay on Vanua Levu. The easiest and fastest way from Suva or Nadi is to fly to Taveuni. Fiji Airways has several daily flights. From Savusavu, take the bus to Natuvu (along Hibiscus Highway), and connect to one of the daily small ferries to Taveuni or we can pick you up from in Natuvu (about 50 minutes) by boat. Courses taught in English and German from Discover Scuba to Dive Master. Group Rates on request. Please note: 2 tank dives and dive packages can not be split or shared. Booked dives are not refundable but transferrable.